« Spring Is Less Than A Month Away! The weather just wants to let us know who’s boss. Our forecast for today is for 20-30 mph winds and high temperature of 47 degrees. 70% chance of rain but not much….maybe a quarter inch. Tonight we are looking at occasional rain or snow after midnight continuing into tomorrow morning. High tomorrow will be in the upper 30s with 15-25 mph winds. Shiver! After this moves through, we will have temperatures in the low 40s to upper 30s through the weekend. By next week, maybe in the low 50s. Had some type of generation over the four and a half days. Of course, they generated something over the weekend. Today, on the other hand, since it is Monday, there is no generation. Oh well! As I say, life in a tailwater! For the most part, however, the generation has been low and definitely fishable. How about this pretty rainbow? Gary and his friend, Lonnie, were fishing yesterday with a low one generator and Lonnie hooked this nice rainbow on a hare’s ear nymph. Jim took Jim and his son, Scott out for half a day Sunday. Jim is from Michigan and actually knows some of the people Jim Lund (our guide) knows in Michigan. So it was not only a fun day of “catching up”, but also catching. Good day on the CQ streamer, a size 18 red midge and the black zebra with a silver head. 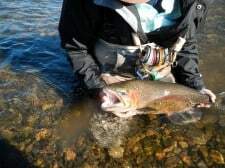 This entry was posted on Monday, February 25th, 2013 at 2:24 pm	and is filed under Fishing Reports. You can follow any responses to this entry through the RSS 2.0 feed. You can leave a response, or trackback from your own site.